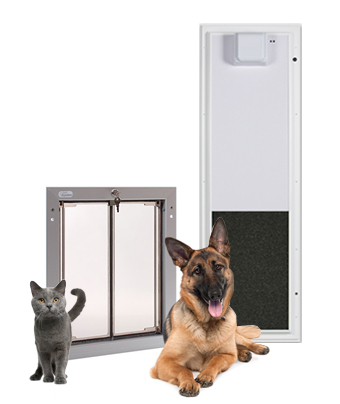 On a manual dog door or cat door, the pet pushes the door open when going through. This type of door is cost effective and available in all imaginable sizes, qualities, and price ranges. Automatic pet doors open when a pet with a key comes close enough. The key is often an RFID tag or a magnet that attaches on the pet’s collar. While there is no guarantee other pets can’t sneak in or out along with the pet that has a key, only the key can make the door open. There are also automatic doors for cats and small dogs that open for the pet’s microchip.